I was honored to be invited to deliver the keynote remarks at the UW-Madison Bolz Center’s Arts Business Research Symposium March 13-14. I previewed those remarks here and am posting the full text serially over the next several days. The talk was originally titled “Not about the Benjamins: Arts Entrepreneurship Research, Practice, and Education.” Here’s it’s just called “The Ouroboros.” This is part 4. Research on arts entrepreneurship – arts AS business and arts AND business happens in several domains. I’ll discuss four of those domains, but it is not an all-inclusive list. First is the realm of economics in which folks like Michael Rushton are theorizing on the price mechanism in the arts and Roland Kushner is tracking the longevity of start-up arts organizations. I would like to see more economics-oriented research in the for-profit arts sector, but that data is harder to come by and funding for primary data collection is scarce. Community resources and development (or community economic development) is another area of research that looks at art and business, often, as alluded to earlier, on the effects of arts-based businesses on community development. 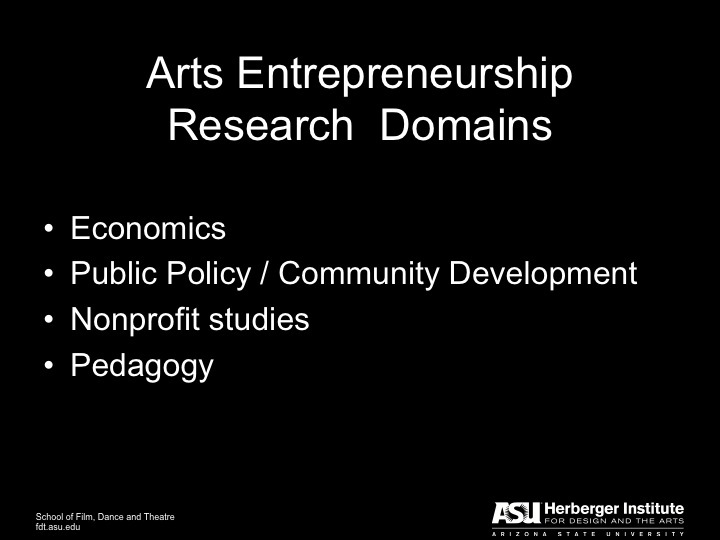 We can also understand this domain to be at the intersection of arts entrepreneurship and public policy. Spurred by the NEA “Our Town” program and its partner ArtPlace initiative, there is a lot of interest on the ways in which arts and culture businesses can enhance what is called “community vibrancy.” Rhonda Phillips and my ASU colleague Gordon Shockley work in this area, primarily from a theoretical perspective, and often drawing examples from Europe and the Commonwealth countries where the concept of “creative industries” is more fully developed. Working at the intersection of art, economics, and policy, research on arts enterprise and community development also includes the work of Ann Markusen, consultant Anne Gadwa Nicodemus, and others. My own research on arts venture incubators could perhaps be considered under this umbrella domain as well. Related to both the economics and community development domains is the nonprofit studies realm. I’ve already referenced Stephen Preece and his work on nonprofit arts venture creation. Mark Hager, another ASU colleague, also works in this area, often on the relationship between nonprofit arts organizations and tourism. Andrew Taylor (who I believe is here today), is following the money – specifically capital – in nonprofit arts organizations. Finally, there is research about arts entrepreneurship in higher ed, both the content and the pedagogy of arts entrepreneurship, much of which is theoretical. 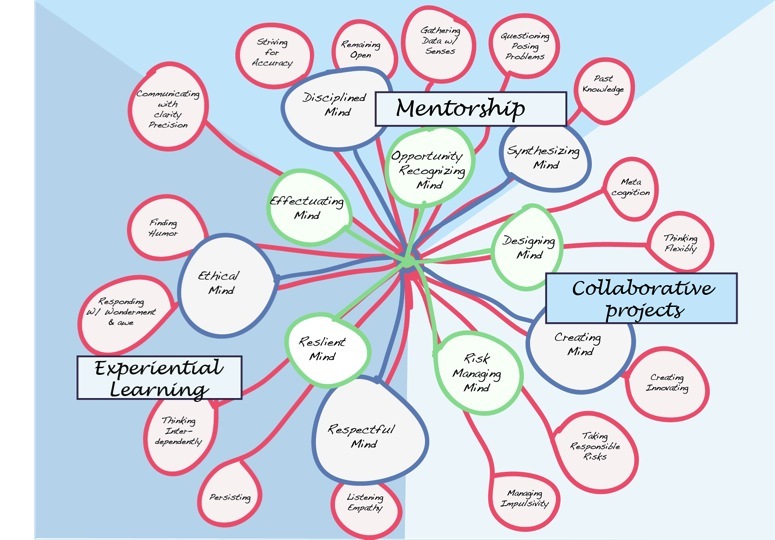 My own work in this area involves developing a framework for teaching students to develop those entrepreneurial habits of mind that support both creative and financial success using three different pedagogies of collaborative projects, mentorship, and experiential learning. I would like to see more research on how to teach to the other end of the arts entrepreneurship continuum – new venture creation — and I will be presenting later this year with my Drexel colleague Neville Vakharia on arts venture incubation as a tool for such pedagogy. This entry was posted in Arts entrepreneurship, arts infrastructure, Arts policy and tagged community economic development, Creative Placemaking, economics, Ouroboros, public policy in the arts, research. Bookmark the permalink.